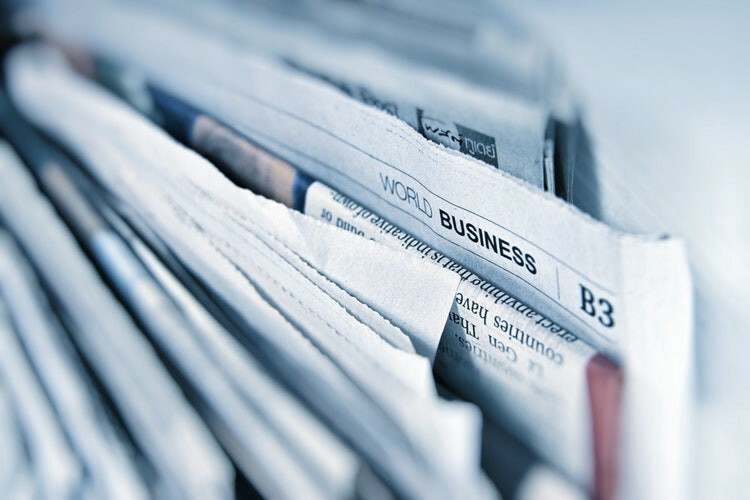 Klaytn, a record breaking sale, the biggest buyback to date, and international progress: it’s been a newsworthy month to say the least! Catch up on everything going on with GET Protocol right here. GET Protocol & GUTS Tickets news from around the world. There are a lot of developments to dive into, so grab a snack and a drink and settle in! It already seems like ages ago, but we started off this month with a huge sale and a notable new record. On March 2nd, roughly 50.000 tickets were sold by GUTS Tickets in approximately 2 hours. This was a 33% improvement in speed over the September ’18 sale of a similar amount of tickets. A pretty decent step forward! The sale was for tickets to Holland’s insanely poplar comedian Jochem Myjer, and it included several venues, spread out over the country. All consumers in the waiting line were given the possibility to highlight their preferred venue, and shown the likelihood of getting tickets for the venue of their choosing. If, during the time spent waiting, the tickets for that specific venue sold out, the consumer was given the choice of other venues where tickets were still available. 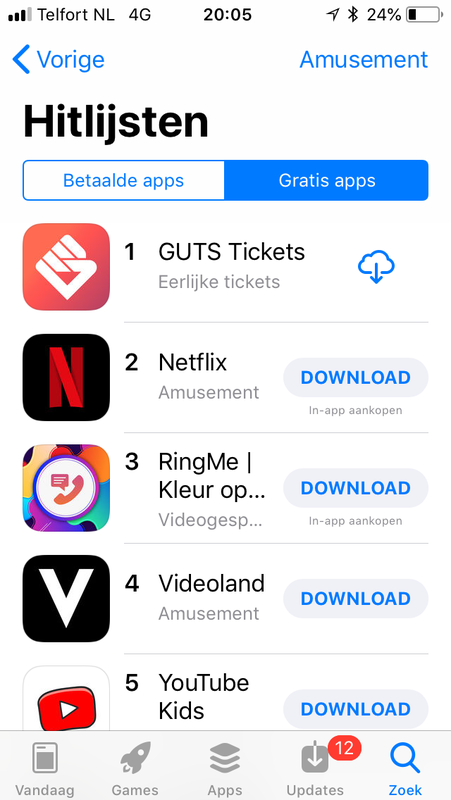 The sale resulted in 118.000 unique users visiting the GUTS website, and causing the GUTS Tickets app to trend on the Google Play store and top the charts as the most popular free app in the ‘Amusement’ chart in the Dutch iOS App Store. Due to Jochem Myjer’s unbelievable popularity, there were still people who had to be disappointed. The sale and the update record also captured the attention of local and international press outlets, resulting in some cool publications. This newly successful stress test proves that GUTS Tickets and GET Protocol are both ready for big(ger) things. The doors are now open for more large-scale and international events, which will be the focus for the time to come. Time to come? As in now? Yes, now! If you were on some sort of tech-free ayahuasca retreat for the past week you may have missed the big news. If so, hope you had a great time, and also: GET Protocol will join the Korean ‘Klaytn’ blockchain platform as an initial service partner. 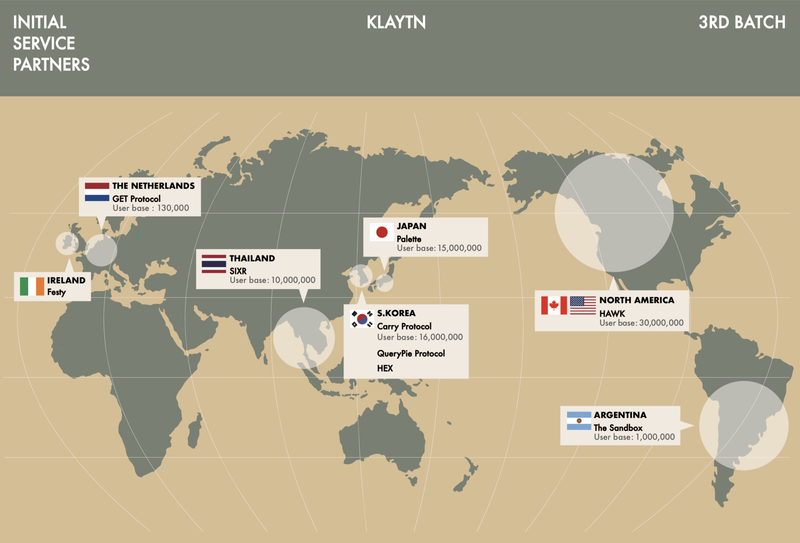 An overview of the third batch of Klaytn’s initial service partners. Also a good moment for international followers to finally learn where Holland is. This is exciting news, as we believe to have found a partner in Klaytn with a similar vision on mainstream blockchain adoption with a significant and reliable backer: Kakao, Korea’s largest mobile platform, with over 50 million monthly users. The Klaytn blockchain is being developed by the blockchain subsidiary of Kakao: Ground X. In the coming months, we will actively be exploring and testing the technical capabilities of Klaytn, with every intention of joining their blockchain when it goes live and the Ground X team delivers on their goal of developing a scalable blockchain platform. Ground X recently raised 90 million in a private coin offering for Klaytn, and plans to raise more in the time to come. Of course it is still early days, as the Klaytn mainnet is scheduled to go live in June of this year. Thus it is important to note that the time to come is meant to further examine whether the partnership can lead to the expected and desired results, on the areas of business development as well as the technical side. If this proves to be the case and we find that a move to the Klaytn blockchain will be beneficial to GET Protocol, its users and its community, we will make the switch. This will not be in the near future, so no action needs to be taken with regards to your tokens. As we have stated before, GET Protocol has always remained blockchain agnostic, hence a move like this would have little to no impact on current and new business. If indeed a token swap will take place, we will announce this way ahead of time, along with a summary of our findings and motivation for the switch. Either way, we will of course not be diluting the value of the token. We are very excited about the vast array of new possibilities already emerging from this partnership, and we will keep you updated on relevant developments as they move along. And that’s not the only news! GUTS Tickets | Get in the Ring Chain Reaction — Bigger. Better. Bolder! Get in the Ring have previously ticketed events in Holland with GUTS, but this will be the first time we take the system across the borders. After conducting several pilots with Get in the Ring and extensive testing of all facets of our system, we are excited to start getting more international experience under our belt. It has already been a great and productive partnership, and we look forward to an even brighter future! This month another new artist joined the fight against dishonest ticketing. Popular Dutch band De Staat announced a new set of dates for their tour, one show of which is going to be ticketed by GUTS! You can get fair tickets for De Staat here. The Australian-British band Dead Can Dance is coming back to Utrecht for two shows in May. Both shows are sold by GUTS Tickets. Podcasts and everything related to them are growing in every direction, including the event sector. For us this is means that we will be ticketing our first live podcast recording, for the last episode of this season for the ‘Man man man’ podcast. For tickets, check out the link below. 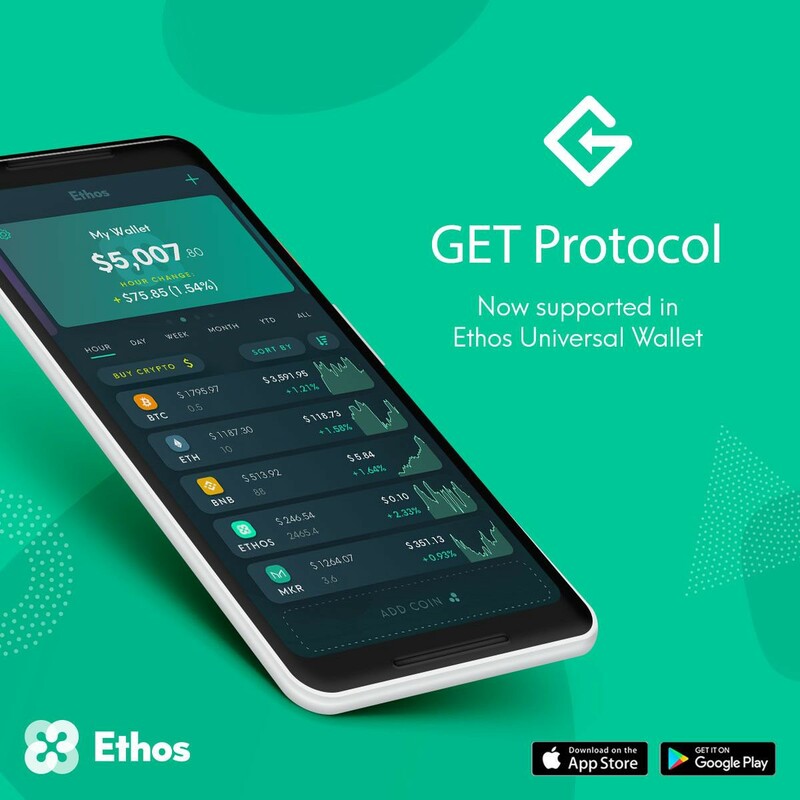 For more information about the Ethos Universal Wallet, click on the image! [Vlogger voice:] Make sure to like & subscribe! Gucci! From blockchain developer Kasper Keunen. On Wednesday March 27th, the first buyback of 2019 occurred. At exactly 14:00 local time the largest buyback to date for the GET Protocol opened. Just a few seconds later the demand for GET by GUTS Tickets’ 132 events ticketed in Q1 of 2019 was filled. 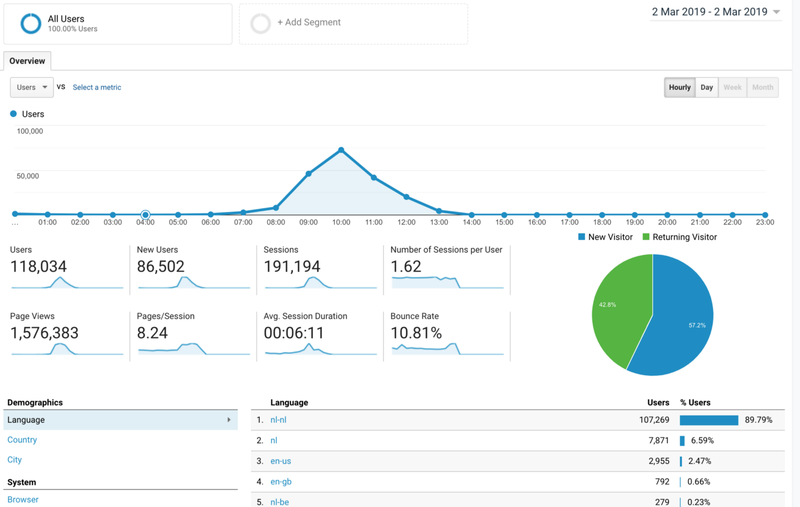 In total, more than 72 000 GET was bought back from the open market. 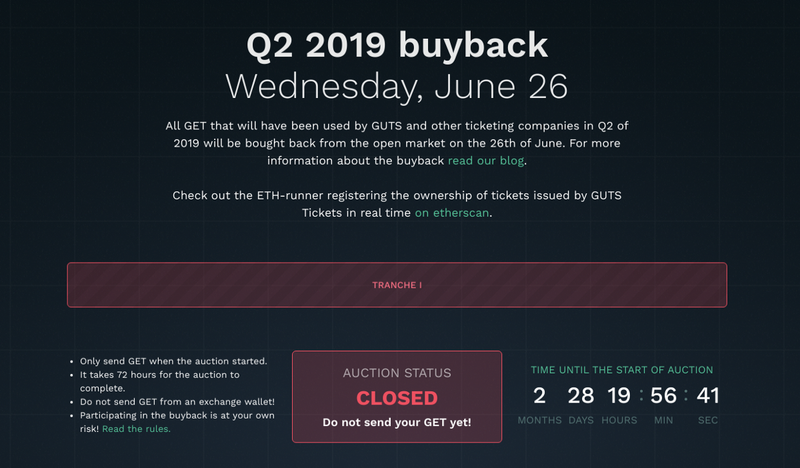 The buyback -totalling €36 055 worth of ETH- was the biggest in size to date and attracted a large number of participants. The difference between the auction’s minimum buyback price (€0.50/GET or 0.00418 ETH/GET) and the open market prise posed a huge arbitrage opportunity for those able to participate. We do think there is some room for improvement when it comes to making the buyback more accessible. In the upcoming weeks you can expect a review on the buybacks rules and overall mechanism. This review will possibly lead to a set of new rules that will make future buybacks economically more efficient and generally more inclusive. We love it when the community helps us in improving the protocol. If you have ideas or general feedback about the buyback we’d love to hear it on the GET Protocol subreddit! Those that participated in the buyback can expect to receive either GET or ETH on the address they participated with before Saturday. 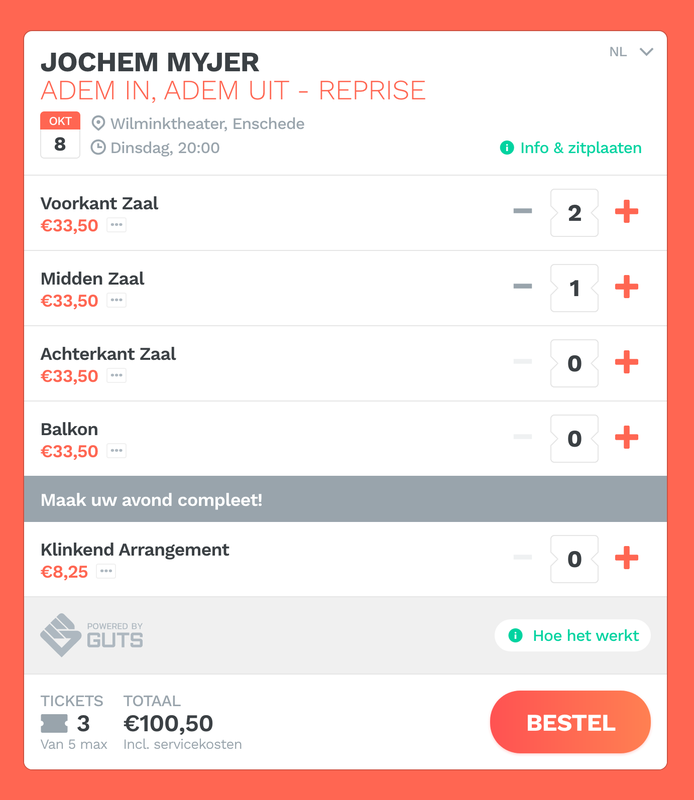 The GUTS ticketshop is now easily integrated as an iframe embed on the websites of artists, theaters and festivals. In order to optimize its effect, we made a new design that is even more user friendly and aimed at creating maximum sales conversion. To create a seamless integration, the look and feel of the ticketshop can be completely customized to match the branding and style of the hosting website. The integration of the ticketshop is as easy as adding some simple code to the host’s website. The new design will soon become the standard for the GUTS website as well. And that concludes this month’s update blog! We are very excited about the recent developments in our quest for worldwide honest tickets, and hope you are too. Any questions or want to know more about what we do? Join our active Telegram community for any questions you might have, read our whitepaper, visit the website, join the discussion on the GET Protocol Reddit. Or get yourself a smart event ticket in our sandbox environment. 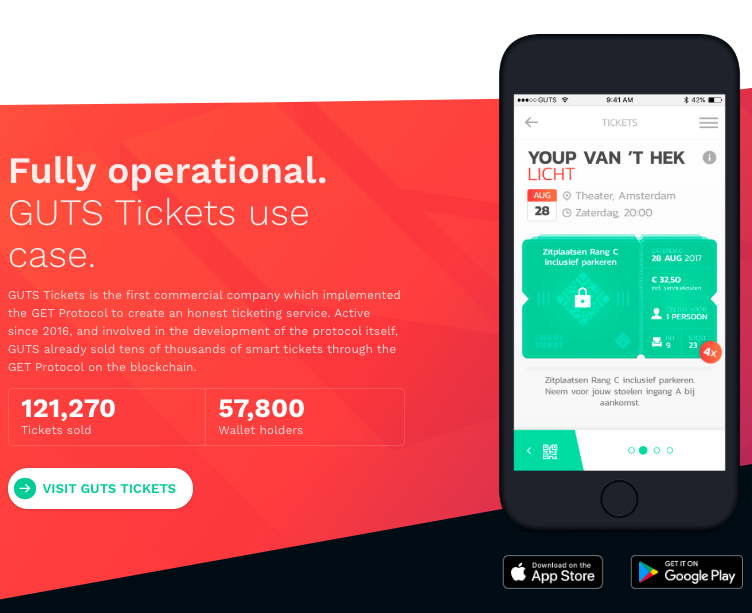 Download the GUTS Tickets app on iOS or Android. Thanks to Kasper Keunen and João Santos.